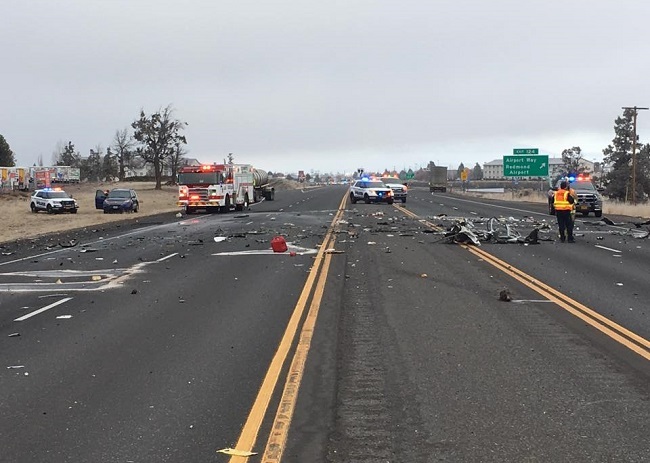 REDMOND, OR -- A boom truck and passenger car collided on Highway 97, just after 9 Wednesday morning, forcing an extensive closure of the highway, on the south end of Redmond. Few details have been released. However, Redmond Police confirm at least one person was killed in the crash near the Yew Avenue/Airport Way onramp. Redmond Fire, RPD, the Oregon Department of Transportation and Oregon State Police responded to the scene. 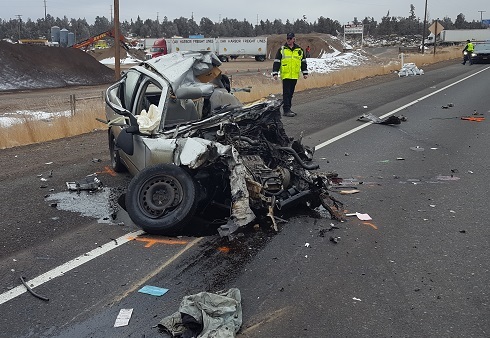 UPDATE (12:45 p.m.: All lanes re-opened just before 12:45 p.m.
(1:45 p.m.) According to Oregon State Police, a 73-year-old Prineville resident was northbound on Highway 97, driving a 2005 Chevy Malibu, when the Malibu crossed into oncoming traffic, near the Yew Ave. exit. The car crashed head-on into a Bend Roof Truss truck, driven by 48-year-old Kavan Rose, of Bend. The driver of the Malibu was pronounced dead at the scene; Rose was taken to St. Charles Redmond with non-life threatening injuries. State Police later identified the deceased as 73-year-old Richard James Lanning. Photos: courtesy Redmond Police, Oregon State Police.